A Nation whose government takes El Niño occurrences as serious quasi-periodic threats and seeks to enact policies to protect its citizens, their livelihoods, and properties—both public and private–can be considered an El Niño-ready nation (ENRN). El Niño is a recurring phenomenon in the tropical Pacific Ocean, appearing on average at least once in a decade but often returning at 2-to-7 year intervals, generally lasting from 9 to 12 months or longer. It results from anomalous air-sea interactions that enable a warm pool of water in the western Pacific to shift eastward toward the central and eastern Pacific. 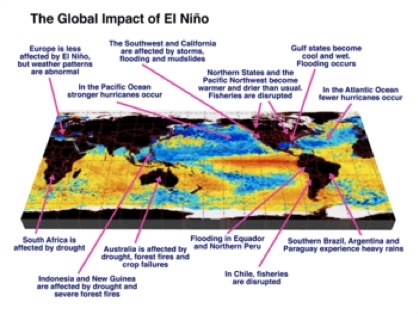 As a result of such a shift, El Niño is associated with many adverse anomalous climate, water, and weather impacts around the globe also often lasting several months to years. The most obvious impacts appear in the form of drought, flood, flash floods and fires each of which has ripple effects in societies and ecosystems. These adverse impacts tend to recur in many (but not all) places and can, therefore be anticipated, planned for, and mitigated, if not avoided altogether. Current guestimates from scientists suggest that El Niño situations are likely to become a more serious and more uncertain concern, as the global climate continues to heat up (e.g. Global Warming). Global warming is expected to increasingly generate local and regional extreme hydro-meteorological hazards, which are expected to become more frequent, more intense, of greater spatial magnitude and of longer duration as well as appear in new unsuspecting locations (e.g. SREX Report). Given such a likelihood, disaster risk reduction (DRR), through informed prevention and preparedness, merits greater visibility in political and socio-economic decision-making processes, given the adage that “an ounce of prevention is worth a pound of cure.” Focusing on El Niño, as a known spawner of hydro-meteorological hazards, is a good place to start not only for risk reduction but also for enhancing the modernization efforts of national meteorological and hydrological services (NMHSs) by the World Bank and other donors of by seeking to modernize them through a logical, incremental but phased approach. The concept of an El Niño ready nation (ENRN) is part of the broader concepts of “Weather ready nation” and “ENSO ready nation.” To become a weather ready nation involves having to cope with a wide range of hydro-meteorological (hydromet) hazards dispersed over seasons only some of which some can be related to an El Niño. By focusing first on preparing for and coping with the hydromet hazards linked to El Niño, a government has put its country on a path toward becoming a weather ready nation. El Niño and the Southern Oscillation, also known as ENSO is a periodic fluctuation in sea surface temperature (El Niño) and the air pressure of the overlying atmosphere (Southern Oscillation) across the equatorial Pacific Ocean. El Niño is so termed because it generally reaches full strength toward the end of the year, and early Christian inhabitants of western equatorial South America equated the warm water current and the resulting impacts with their holiday celebrating the birth of Jesus (known as El Niño in Spanish). Trenberth identified the dates and lengths of El Niño and La Niña events in a 1997 BAMS according to his definition of El Niño based on SST anomalies in the region of the tropical Pacific known as Niño 3.4. Drier than Average over Indonesia and Australia Increased Snowfall in the North Western U.S.
ENSO arises from changes across the tropical Pacific Ocean. So why does ENSO affect the climate over sizable portions of the globe, including some regions far removed from the tropical Pacific Ocean? Does the strength of ENSO matter for global impacts? ENSO affects the sea surface temperature (SST) in regions where fishing is a major industry to some countries. A prominent example is the anchovy fishing routinely done off the northwest coast of Peru. When El Niño occurs, the warmed waters become unfavorable for the fish, which flee for cooler waters, resulting in poor harvests that are detrimental to the Peruvian economy. But the abnormal tropical Pacfic SSTs are only the beginning of the story of ENSO’s impacts. 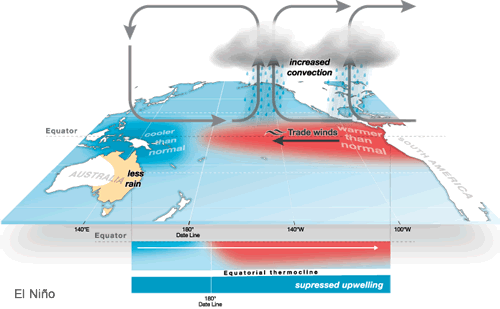 When El Niño occurs, the central and eastern tropical Pacific Ocean becomes warmer than average. With the elevated SST, there is more thunderstorm activity, or convection, than usual over the waters in the central and eastern tropical Pacific. This convection is caused by the increased temperature and moisture in the air right above the warmed water. This warm, moist air rises to form thunderstorm clouds. The process causes latent heating in the upper atmosphere: heat from the warmed surface of the ocean is released when water vapor condenses into clouds and rainfall. With more storminess than usual, the upper atmosphere becomes warmer than usual, and this extra heat sets in motion yet another series of important effects. An Internet search for the keyword “hotspots” turns up two types of sites. One type focuses on positive things (interesting, fun, recreation); skiing hotspots, scuba diving hotspots, resort hotspots, dancing hotspots, and so on. The other category of hotspots highlights negative things; coral bleaching hotspots, toxic pollution hotspots, disease hotspots, biodiversity loss hotspots, health hotspots, conflict hotspots, and so forth. Hotspots identification has clearly gained popularity with respect to changes in the environment. Although there are hotspots for just about every environmental problem one can think of, fewer are focused on interactive hotspots such as the interface between agriculture and forests, or the interface between cultivation and grazing. Interestingly, there is no explicit mention of El Nino hotspots. Hotspots could be defined as regions that are likely to be affected by an El Nino. 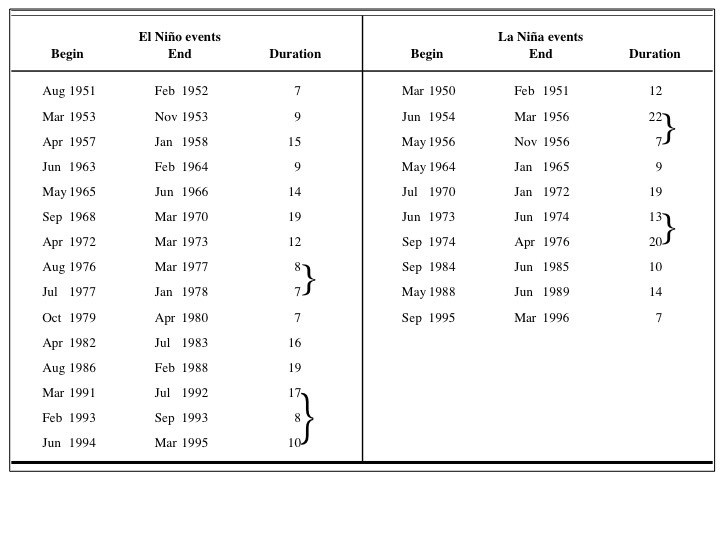 In the mid-1980s Ropelewski and Halpert compiled maps of El Nino’s teleconnections (e.g. likely impacts on temperature and rainfall). Those maps continue to be used in one form or another today and are widely reproduced in hundreds of scientific publications. The media like to use them in their popular science articles explaining what an El Nino event is and what it might do.